Help Us Solve This Case! 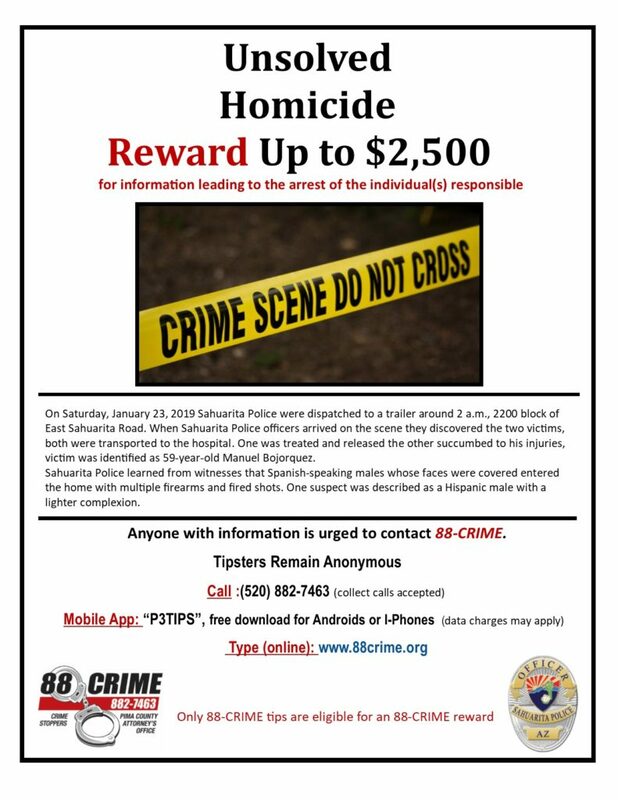 Leave an anonymous tip by calling 88 Crime at (520)-882-7463 or click the button to fill out a simple form. Leave an anonymous tip by calling our Hotline at (520)-882-7463 or click the button to fill out a simple form. 88-CRIME Program is the Pima County Attorney's Office anonymous tip line for citizens to report information to help solve crime. The information will be channeled to law enforcement. This Program provides the community an opportunity to assist in the fight against crime safely and confidentially. A person providing information may be paid up to $2,500 if the information leads to a felony arrest or indictment. The Board of Directors determines reward amount. 88-CRIME, Inc. is a 501 (c)(3) non-profit corporation. Reward procedures and decisions are made by the 88-CRIME Inc. Board of Directors. 88-CRIME Inc. accepts contributions and raises funds to pay the rewards. Tax dollars are not used.